Reconstruction of the living Araucarioxylon arizonicum tree. The second-largest fossil forest of its age in North America, if not the entire world, is in the Circle Cliffs portion of Grand Staircase–Escalante National Monument in southern Utah. However, because of its remote location, very few people know of its existence, much less have ever visited it. Furthermore, this forest has never been scientifically documented. Nevertheless, the Bureau of Land Management recognized its significance long ago and designated six sections of land as the Wolverine Petrified Wood Natural Area. The forest itself does not have an official name, but is sometimes called the Wolverine Petrified Forest. It lies about 15 miles southeast of the town of Boulder and 20 miles east of Escalante. Although the Wolverine Petrified Wood Natural Area includes about 3,800 acres, most of the exposed petrified wood and the largest logs are on the floor of an unnamed dry wash that drains into Wolverine Creek. Here the logs are mostly preserved in place and exposed by erosion; it is this deposit that is called the Wolverine Petrified Forest. Elsewhere in the Natural Area the wood consists mainly of small isolated blocks that were transported relatively longer distances after exposure. In some places, the gentle slopes are densely littered with blocks of all sizes. 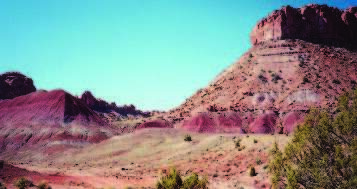 The fossil wood preserved in the Wolverine Petrified Wood Natural Area originates from the Late Triassic Chinle Formation, which forms the generally reddish-colored slopes below striking vertical cliffs of tan sandstone here and throughout the Circle Cliffs region. This formation was deposited about 225 million years ago, at the beginning of the Age of Dinosaurs (Mesozoic Era), by rivers and streams on the floor of a broad basin on the western edge of the ancient supercontinent called Pangaea. At that time, Utah was geographically situated farther south than today, probably near the latitude of present-day Cuba. Streams in the Chinle basin were generally flowing in a north to northwesterly direction toward the sea, which occupied what is now eastern Nevada and California. The now-fossilized wood found in the Wolverine Petrified Wood Area came from trees that grew along the banks of one of these streams and possibly from adjacent highlands. Although the Chinle Formation is reported to be about 550 feet thick in this area, most of the petrified wood it contains seems to be near the middle of the formation in a distinctive bed of pinkish sandstone about 10 feet thick. 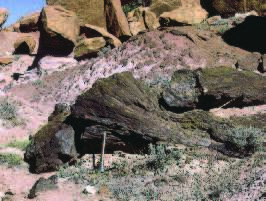 This bed is in the Petrified Forest Member and probably correlates with the Black Forest Bed in the upper part of the same member in Petrified Forest National Park, Arizona. 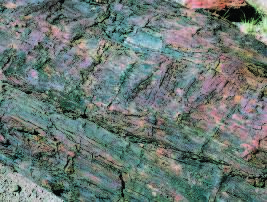 Evidence for this correlation is based on bedding similarity and the presence of black fossil wood, some of which is restricted to the Black Forest Bed and equivalent rock units. The bed of pinkish sandstone was deposited by only one of the many north-flowing streams that formed the Chinle Formation. The orientation of the logs seems to be random, although about one-quarter of them are oriented generally northeast. This may indicate that stream flow followed the same general trend. There are places in the bed of sandstone where as many as three logs overlap each other, suggesting that logs probably were carried into the area not just once but at several times during a relatively short interval during the Late Triassic. Unlike most of the fossil wood in the Chinle Formation elsewhere in Utah and in the more famous and much larger Petrified Forest National Park, the wood in the Wolverine Petrified Wood Natural Area is typically black on fresh surfaces. The original dark color of the specimens has been enhanced by the dark patina termed “desert varnish” that commonly develops on exposed rock surfaces in the southwestern United States and in other arid regions of the world. The surfaces of many of the logs are brownish when they are first exposed by erosion, but weathering soon removes the brown coloring and reveals the characteristic black color of the wood. Most of the fossil wood in the Wolverine Petrified Wood Natural Area results from the petrification process called permineralization. In this process, empty spaces in the original wood have been filled with quartz and the original cell structure is visible with a microscope. 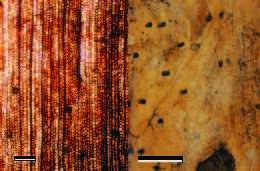 The remaining organic matter in some of the wood was subsequently completely destroyed and then replaced by the same mineral; as a result, these fossils lack cell structure. These fossils are clearly the remains of trees, because they look like tree trunks or fragments of tree trunks that have lost their bark as well as their limbs and roots. This similarity was not lost on the local Native Americans who traditionally considered them to be the spent arrow shafts of one of their gods. The stumps of limbs and roots are still attached to some of the trunks in the Wolverine Petrified Forest. Loss of the limbs and roots probably occurred mostly as the trees floated downstream. Many of the trees probably fell into the streams when the riverbanks they were growing on were undercut by channel erosion. At least some of the trees in the Wolverine Petrified Forest were attacked by bark beetles and killed. The evidence for this consists of narrow, transverse ridges around the trunks that resemble structures formed by modern bark beetles between the bark and the wood of trees. Such girdling undoubtedly caused the deaths of some of these ancient trees just as it results in the death of modern trees. Eventually, the ancient trees that had been attacked would have fallen over after they died. Then, because of natural decay, they lost their limbs and roots on the forest floor before being washed into streams that formed this deposit. The longest and most complete logs in the Wolverine Petrified Wood Natural Area occur in the Wolverine Petrified Forest. Here, the logs are up to nearly 100 feet long and range from about 1.5 – 3 feet in diameter. Because they are still partially buried, the logs evidently have not been moved by erosion since they were exposed many years ago, although parts of them have broken off and disappeared. A recent search of the Wolverine Petrified Forest revealed nearly 100 such in-place logs. Scattered between these more-or-less intact logs are hundreds of small blocks of petrified wood that were transported some distance after exposure and breaking off the large logs. This process is ongoing and the fossil wood continues to be broken into still smaller and smaller pieces. In many places along the walls of the wash, more logs and small fragments of logs are just now being slowly exposed to view by erosion. Most of the fossil wood appears to represent Araucarioxylon arizonicum, a species of fossil wood common throughout the Chinle Formation at many localities in Utah, Arizona, and New Mexico. 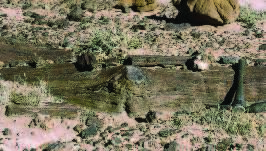 A small amount of a second species of wood called Woodworthia arizonica is also present in Wolverine Petrified Forest. It has a much more limited distribution and occurs mostly in Petrified Forest National Park in a bed that probably was deposited at the same time as the petrified wood-bearing bed in the Wolverine Petrified Wood Natural Area. Both species are extinct, and we can only surmise what they looked like when living. However, a recent study of the trunks identified as Araucarioxylon arizonicum that are exposed in Petrified Forest National Park showed that the mature tree had a diameter of nearly 10 feet about 5 feet above the base and stood as much as 180 feet tall. The trunk of the tree tapered evenly from a slightly expanded base to the top. A ring of steeply inclined roots grew into the ground at steep angles and a long, stout taproot held the tree upright. Lateral branches had no systematic arrangement on the trunk and diverged from it at steep upward angles. Presumably, the branches swept downward and outward so as to present a large area of foliage to solar radiation. The apices of the branches may have turned upwards slightly like certain modern trees. Most of the branches likely carried viable foliage until the tree died. The bark was relatively thin and modern looking. As is typical of modern trees growing in the tropics, the wood did not contain annual growth rings, although it did show evidence of occasional growth interruptions. Unfortunately, the leaves and reproductive structures are unknown. 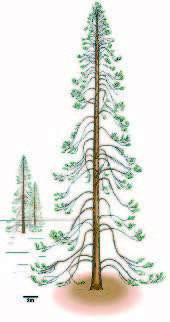 The taxonomic relationships of the tree are unknown beyond saying it is an extinct conifer of some type. Unlike the smooth surfaces of the trunks of the Araucarioxylon arizonicum trees, the fossil trunks of the Woodworthia arizonica tree are covered with distinctive small, shallow holes about 1/4 inch in diameter. These holes apparently represent small branches that never fully developed. The tree was about half the height of the Araucarioxylon arizonicum and also had lateral branches irregularly arranged along the trunk. Like the wood of the Araucarioxylon arizonicum trees, the wood of the Woodworthia arizonica tree does not have annual growth rings and its leaves and reproductive structures are unknown. Thus, it can only be treated as another type of extinct conifer. No fossil leaves, cones, or seeds have been found in the bed of sandstone that contains the Wolverine Petrified Forest, but other beds in the Chinle Formation in the area do contain such fossils. These fossils indicate that a variety of ferns, cycadophytes, conifers, and other small plants inhabited this part of Utah at other times during the Late Triassic. Similar plants probably grew beside the trees now represented by the fossil trunks in the Wolverine Petrified Forest but for some unknown reasons were not preserved. The 225-million-year-old Wolverine Petrified Forest of southern Utah documents one brief episode in the long geologic history of the state. The forest contains the fossilized remains of several elements of an ancient terrestrial ecosystem that existed in southern Utah at the beginning of the Age of Dinosaurs. 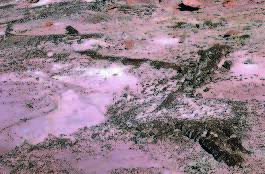 These fossils and the rocks that contain them indicate that the climate has changed over the years and that this area was not always a desert. In fact, this was a moist tropical environment in which large trees and probably other plants grew along the banks of many streams and rivers. Dr. Sidney Ash is an adjunct professor of Earth and Planetary Sciences at the University of New Mexico in Albuquerque. Prior to retirement a few years ago he was Professor of Geosciences at Weber State University in Ogden, Utah. Ash specializes in the study of the plants of the Age of Dinosaurs and has published many articles about them in professional journals. He first visited the Wolverine Petrified Wood Area in 1972 while searching for plant fossils in the Chinle Formation.